Today we are sharing TWO gorgeous Christmas cards by Maria! 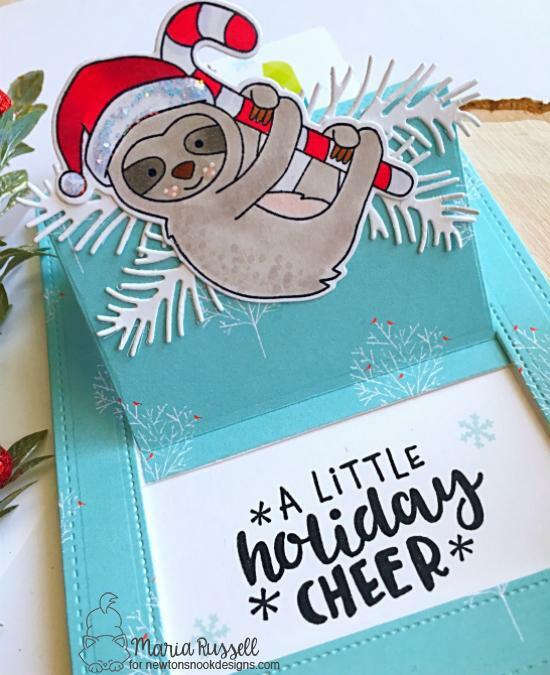 She featured our adorable new sloth from our new Slothy Christmas Stamp Set. On the first card she colored the sloth with copics and cut him out using the coordinating Slothy Christmas Die Set. Then for her card she made a lovely snowy background and it's a shaker card too, filled with lots of sparkly confetti! Across the top she added bunch of tiny stockings that were cut out using our Ornamental Shaker Die Set. In the corner she added a trio of pine trees using our new Forest Scene Builder Die Set. For the sentiment she used the big die cut Merry from our new Holiday Greetings Die Set and combined it with the stamped "christmas" from our Snow Globe Scenes Stamp Set. 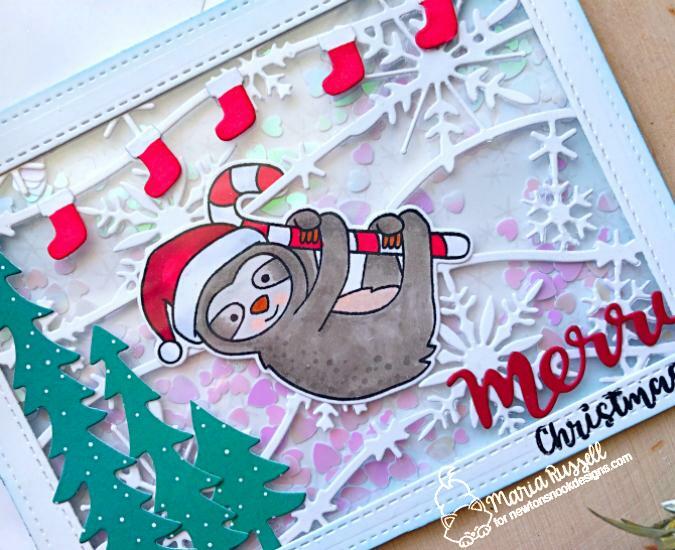 She used the adorable sloth image from the Slothy Christmas Stamp Set a second time, this time perching him onto a fun slider card! She colored him again with copics and this time she added some fun sparkle to his hat! She cut him out using the coordinating Slothy Christmas Die Set. Then she surrounded him with branches that were cut out of white with our Pines & Holly Die Set. When the card slides up, it reveals the fun sentiment, "a little holiday cheer" that was stamped using our new Ornamental Wishes Stamp Set. So fun! Both cards are so gorgeous! Love the idea with the gift card slider!!! Great job! The slider card is awesome. It looks like you used dies to cut it out. Is there a die set that makes the slider card or did you some how alter the die so the top did not cut?